"Instant sleep. Miscellaneous effects of paralysis, partial and complete catalepsy, partial or complete attraction. Phreno-magnetic effects... Musical ecstasy... Insensitivity to physical pain and instant awakening... transfusion of magnetic power to others..."
Hypnosis is "a trance state characterized by extreme suggestibility, relaxation and heightened imagination". It is an altered state of consciousness. 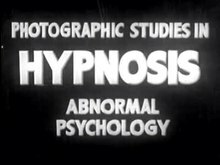 Usually, one person (the "hypnotist") talks to another (the "subject") in a special way that puts the subject into a trance. While the subject is in this state, he can be influenced by suggestions. The hypnotist can tell him to forget his name, or that the room is hot (he will start sweating), or that he is someone else. Hypnotic suggestions may be delivered by a hypnotist in the presence of the subject, or may be self-administered ('self-suggestion' or 'autosuggestion'). The use of hypnotism for therapeutic purposes is referred to as 'hypnotherapy', while its use as a form of entertainment for an audience is known as 'stage hypnosis'. Contrary to a popular misconception—that hypnosis is a form of unconsciousness resembling sleep—some contemporary research suggests that hypnotic subjects are fully awake and are focusing attention, with a corresponding decrease in their peripheral awareness. Subjects also show an increased response to suggestions. However, the behaviour of subjects under hypnotism goes so far beyond normal focused attention that the description of "altered state of consciousness" is more used. Hypnotherapy is when a hypnotist uses hypnosis to help the subject heal emotionally, or to heal a sick mind. Hypnotherapy is hypnosis used for therapy. Hypnosis can also be done by one person acting alone. Then he is acting as both hypnotist and subject. This is called "self-hypnosis," or sometimes "auto-suggestion." In some cases, this is simply a form of using trance. Almost every pre-modern society had practices which were somewhat like hypnotism. Often a special person in a society (witchdoctor, shaman, priest...) would conduct a ceremony. The ceremony might use incantations (spells), chants, repetitive music, mind-altering substances, darkness, fire, and other settings. The purpose was to send a person or group into an altered state of mind like a trance. Even literate societies such as ancient Greece had phenomena suggestive of hypnosis. The Delphic oracle was in a trance of some kind as she uttered her famous predictions. Whether that was self-hypnosis or just the effects of volcanic gas will never be known. There seem to be many ideas about how hypnosis started. Historic records in modern Europe start with the work of Franz Mesmer, though he did not invent the word 'hypnotism'. Mesmer and his followers practised what was first called 'animal magnetism', and later mesmerism. Descriptions of his work leave no doubt that he had discovered for himself what we now call 'hypnotism'. The words hypnosis and hypnotism both derive from the term neuro-hypnotism (nervous sleep) coined by the Scottish surgeon James Braid around 1841. Braid based his practice on that developed by but differed in his theory as to how the procedure worked. The main hypnosis discoveries came in 1842 when Braid started to learn more about its effects. He did not think that 'mesmerism' was the cause of hypnosis, and in the end he thought that trances were only a 'nervous sleep'. In 1843 he wrote a book about this with the title Neurypnology. In this book Braid described hypnotism as a state of physical relaxation accompanied and induced by mental concentration ("abstraction"). Hypnosis is used to treat fears, addictions, emotional trouble, pain control, stress, and so on. The hypnotist must do two things to do hypnosis. First, he must put the subject into a trance. Second, he must lead the subject through the trance process (for therapy, or whatever effect is needed). Often, he will switch between these, first making sure the subject is in the proper state of mind, and then leading him through the process. These steps are repeated in a cycle throughout. In trance, the subject does not make decisions about the truth of the hypnotist's suggestions: If trance is reached—it is not always—the subject will accept as true anything the hypnotist says, unless it goes against the subject's deepest beliefs. This is the heart of hypnosis: to put the subject in trance so he will accept suggestions. Stage hypnotists get truly amazing effects from good subjects: they can make them forget their names, believe they are someone else, make them see people who are not there, make them forget letters or numbers, and so on. This happens because the subject actively follows the hypnotist's suggestions, because he trusts the hypnotist and he believes it is safe. If the trust is broken or the subject believes it is not safe, the subject may emerge from trance. Hypnosis is not truly a power resting in the hypnotist. Instead, the power rests in the mind of the subject. The hypnotist simply knows how to guide the subject through trance. ↑ Harris, Tom (2001). "Science vs. myth". Science.howstuffworks.com. Retrieved 2011-11-28. ↑ Lynn S, Fassler O, Knox J (2005). "Hypnosis and the altered state debate: something more or nothing more?". Contemporary Hypnosis 22: 39. doi:10.1002/ch.21. ↑ ↑ Tart, Charles T. 1969. Altered states of consciousness: a book of readings. New York: Wiley. ISBN 0-471-84560-4. ↑ Coe W. et al 1972. Hypnosis as role enactment: focus on a role specific skill. The American journal of clinical hypnosis 15 (1): 41–5. doi:10.1080/00029157.1972.10402209. PMID 4679790. ↑ Lyda, Alex. Hypnosis gaining ground in medicine. Columbia News. Columbia.edu. Retrieved on 2011-10-01. ↑ Steven J. Lynn; Judith W. Rhue (1991). Theories of hypnosis: current models and perspectives. Guilford Press. ISBN 978-0-89862-343-7. Retrieved 30 October 2011. ↑ Dodds E.R. 1973. Supernormal phenomena in classical antiquity, in his The ancient concept of progress. Oxford University Press. ↑ Braid J. 1843. Neurypnology or the rationale of nervous sleep considered in relation with animal magnetism. John Churchill, Buffalo, N.Y.